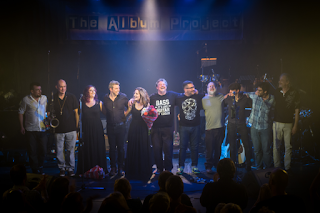 These words, taken from the official website of ‘The Album Project’ describe the genesis of a unique musical collective that has recently taken audiences by storm with two sell-out shows in Cheltenham, Gloucestershire. Founded by Simon Young (drums) and Jonathan ‘Jake’ Kirkpatrick (Bass), ‘The Album Project’s mission statement is to bring ‘classic albums to live performance in an authentic and inspiring way’, but the almost flippant tone of the above quote belies the true complexity of the challenge they had set themselves. Thankfully the duo’s commitment, enthusiasm and considerable professional experience paid off and ensured that this simple idea more than lived up to its potential, resulting in a show that appeals not just to the hard-core fans of the source material but to anyone who enjoys the heady mix of bombast, intimacy and sheer virtuosity of live rock music at its absolute best. So what sets ‘The Album Project’ apart? No mere group of jobbing musos they, simply rattling off their idol’s greatest hits with reckless abandon. They’re neither a slavish tribute band, nor simply a straight up covers band. The personnel roster is ever changing round the assured core team of Simon and Jake, a flexible ensemble of talented singers and musicians selected for each show according to the unique requirements of the material. 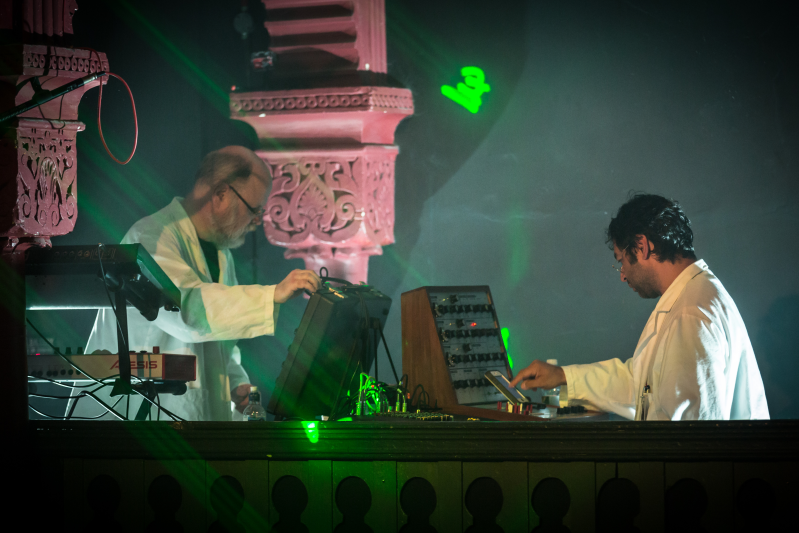 Thus each performance showcases a varied collection of experiences and personalities, not to mention an enviable array of vintage and cutting-edge gear. The result is a group who can accurately re-create the source material without being overshadowed by it, each gig exuding a sense of giddy fun, collaboration and charm that’s uniquely their own. 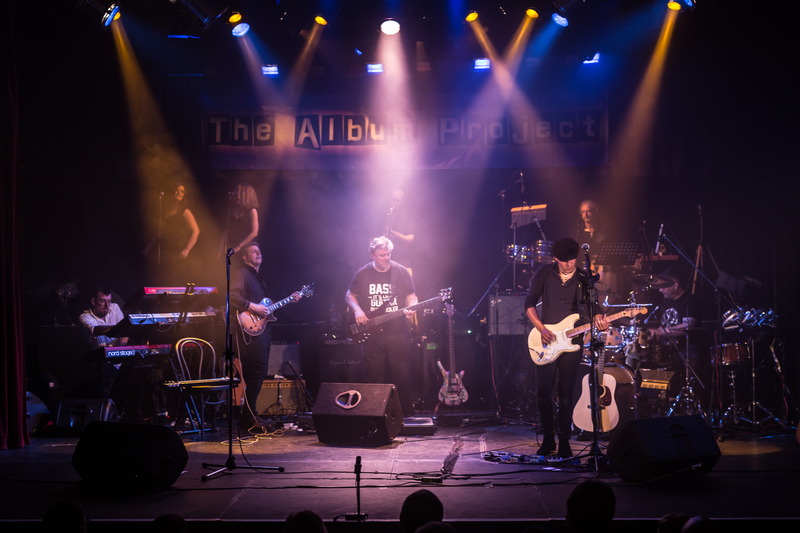 Having generated considerable pre-show buzz though social media in the months prior, ‘The Album Project’ made their debut on December 15th, 2015 with a performance of The Who’s double LP ‘Quadrophenia’ at the Cheltenham Playhouse. To say the audience were not just amazed, but blown away would be an understatement. If this sounds like empty hyperbole, ask anyone who was lucky enough to be there and they’ll tell you that any number of colourful adjectives would hardly do justice to the accomplishment they witnessed that night. Fulfilling their stated aim of ‘bringing some of the greatest albums ever recorded into live performance’, not only did Simon and Jake’s ensemble produce an authentic recreation of the album’s every effect, riff and cymbal crash to the point you could almost hear the vinyl itself crackle and pop, but, fronted by phenomenal guest vocalist Josh Rawle they brought it all to vivid raucous life with a swagger and good humour that almost dared to make it look easy. Audience feedback from the first gig was overwhelmingly positive and unsurprisingly, the band quickly secured a return engagement at the Cheltenham Playhouse. 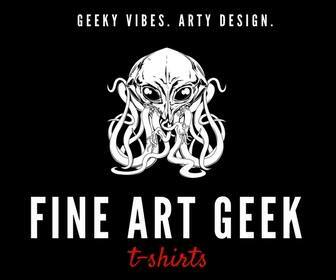 And so, the second weekend of June 2016 saw not one, but TWO packed evenings as they considerably upped their game with ‘The Music of Pink Floyd’. Drawn from the key period between 1973 and 1981 which saw The Floyd reach their musical and commercial peak and filling stadiums across the globe, the set included some of the biggest crowd pleasers from albums ‘Wish You Were Here’ and ‘The Wall’ as well as a complete performance of Prog Rock masterwork ‘Dark Side of the Moon’. After ‘Quadrophenia’, the bar was pretty high. Would this be a case of the proverbial ‘difficult second album’? As you’ll have already read, ‘The Album Project’ is a group whose appeal has grown beyond their humble roots in mere pastiche or homage. In an auditorium full to capacity, the excitement was palpable as the arrival of founder, drummer and thoroughly affable spokesman Simon signalled the start of the show. 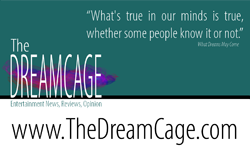 The growing buzz quickly made it apparent that the group’s very presence was becoming a unique draw in itself. If you could experience only one example of ‘The Album Project’s musical and performing prowess then their note perfect rendition of ‘Shine On…’ would almost be worth the price of admission alone, but as an opener, it was an inspired choice. Not least because the slow crescendo of the opening instrumental was the perfect opportunity to take in the surroundings and marvel at the scale of a show that made the modest 200 seat venue feel like a night at Earl’s Court. When not entranced by a the brilliantly utilised lasers, brought to life through a swirling haze of dry ice floating lazily up to the gods, you’d find yourself amazed at just how much gear and personnel they managed to fit in. The main stage, sporting not just the usual impressive array of guitars and drums, but cramming in an additional percussionist, multiple keyboards, bass and a brace of backing singers, was only half the story. A glance up at the balconies to brought with it the sight of a small army of sound and lighting technicians, their faces masks of studied calm, and more excitingly, a pair of vintage analogue synths (an EMS-Synthi AKS and VCS3) the very models used on the original recording of ‘Dark Side…’. No effort, or expense it seems had been spared in the quest for authenticity. Speaking of ‘Dark Side…’ the atmosphere took on an almost cathedral-like air as Bassist Jake’s casual introduction gave way to the pulsing heartbeat of ‘Speak to Me/Breathe’ and the group got to work on The Floyd’s magnum opus. It’s surely no easy feat to recreate the complex, multi-layered soundscape of ‘Dark Side…’ in a live setting and even Pink Floyd themselves experienced their share of gremlins while touring the album in the early 70s. The temptation here might therefore be simply to let modern digital technology do the heavy lifting, and while no doubt some of the perfectly timed audio clips of chiming clocks, laughter and ruminations on violence and madness were queued up to play at the touch of a button, those watching intently will tell you, not a single note of the music itself was the result of technical trickery or digital shortcuts, and behind every riff, clever phrase and solo was a real heart and mind. First and foremost, the pairing of guitarists Brynley Thomas and Mike Maddams filled the role of front men with far more verve and swagger than the generally more reserved Dave Gilmour and Roger Waters. Mike’s versatile voice covering the majority of lead vocals originally shared between three members of Pink Floyd was impressive, particularly as his share of the guitar work was never less than challenging, while Brynley’s assured yet still thrilling solo work was carried off with a seemingly care free joy in his craft that might well make Waters frown. As the cacophony of ‘Speak to Me’ gave way to ‘Breathe’, the sight of Brynley casually swapping his Les Paul for a lap steel and some sublime slide work made the slight smirk and winks to the audience entirely forgivable (sorry Roger). Here was a man firmly in his element and enjoying every second of it. The beauty of, ‘Dark Side…’ though is how well suited it is as an ensemble piece, as the ever shifting musical landscape moves on, so too does the proverbial spotlight and so each member of the band had their chance to shine. Ironic then that that proto electronic instrumental ‘On the Run’ with its emphasis sound effects and looped phrases was one of the standout performances of the evening. As the lights dimmed, a single spotlight illuminated a pair of unassuming gentleman up on the balcony as they coaxed the aforementioned analogue synths through manually programmed loops, hi-hat and Doppler effects giving the whole piece a wonderfully organic feel. Billed as ‘The Retro Synth Twins, Hamstall Ridware and Bromley Hayes’ the duo began the piece with the air of scientific cool but soon demonstrated a theatrical flair as the sounds became more fractious and urgent, both men standing up and feigning frustrated violence towards their erstwhile instruments. Credit here must also go to the sound designers, who enhanced the effect considerably, sending the dynamic sounds whooshing round the auditorium like the world’s biggest quadrophonic stereo. This also ensured that the famous chiming clocks of ‘Time’ made a suitably resounding impression as the performance moved on again, and the smaller details began to shine through. Simon Young, seemingly content to provide the backbone of the impressive wall of sound by marking time like a metronome, almost casually tapped out perfectly time series of beats on the tom toms before the band got into full swing once more. It was here that the backing singers too began to make a big impression as Louisa Gaylard and Louise Beadle faded up in the mix and brought the requisite chills as ‘Time’ drew to a close before Louisa made another spotlight performance with ‘The Great Gig in the Sky’, matching the raw power and passion of Clare Torry’s original vocal, wooing the audience into stunned silence before being re-joined by Louise to trade phrases and round out the number in suitably epic style. Jake Kirkpatrick kept the groove going as he hammered out the signature bass riff of ‘Money’, astride his ‘Pleasure Board’ (ask him) with all the glee of a man marvelling at his own achievement, all the while still commanding the audience’s attention as the signature jazzy groove led the band into full flight. Scintillating guest artist as Paul Chaundy let fly with the virtuoso Saxophone solo and produced a blistering interpretation of the original whilst still adding his own stamp to the number in the finest tradition of the song’s Jazz roots before the mood finally settled and keyboard player Ian Munday gave moving flight to the very heart and soul of the late Rick Wright, Pink Floyd’s late piano and organ maestro as the more ruminative pairing of ‘Us and Them’ and ‘Any Colour You Like’ reminded us of the full breadth of the original Album’s tone. And so it was that with barely a chance for the audience to enjoy a recuperative drink or two settle back into their seats to murmur excitedly about what delights might be in store for the second half, the group burst back into life without warning. The curtains had barely parted, nor the lights dimmed before Brynley, Mike, Ian and the rest of the group wrestled the opening bars of ‘Have a Cigar’ into submission and ‘The Album Project’ settled back into their Pink Floyd Masterclass. Put simply, part two saw a band unleashed and playing to their true strengths as an exhilarating, full blooded rock spectacle. As they pounded out a brilliantly compiled selection of highlights from ‘Wish You Were Here’ and ‘The Wall’, they easily topped the studied professionalism of ‘Dark Side…’ with a muscular adrenalin fuelled performance that arrived like a jet engine to blow away the dreamlike haze of part one. The heart of this set was a medley from ‘The Wall’ from ‘In the Flesh?’ through ‘Hey You’, ‘Another Brick in the Wall (Part 1)’, the audience was taken on a rollicking thrill ride, with band working in a less varied soundscape, but as a much tighter unit for it. Brynley Thomas took on more of the lead vocals in part two, giving a slightly harder edge befitting a more sneering, angrier Floyd. His sense of playfulness remained however and he and Mike began to play off each other with easy spontaneity, at times bashing out the riffs in perfect tandem, each with a huge grin, their energy infectious. For all the emphasis on straight up rock however, there was still plenty of room for surprises, even with an audience largely familiar with The Floyd’s oeuvre. And so it was as the thumping, ominous howl of ‘The Happiest Days of Our Lives’ heralded the imminent arrival of the one true hit single of Pink Floyd’s career, the disco inflected ‘Another Brick in The Wall (Part 2)’. As the chorus approached and with no troop of school children in sight to fill the infamous refrain of ‘We don’t need no education’, Brynley motioned to the seated crowd to take the spotlight and fill in the gaps in a piece of inspired audience participation which thrillingly blurred the lines between entertainers and entertained. In retrospect, the pair of songs selected for the groups encore was inevitable; as if for no other reason than their exclusion from such a definitive set list would have been nothing short of criminal. It was still a goosebumps moment however as Brynley and Mike strapped on their respective 12 and 6 stringed acoustics and the familiar static and radio chatter of ‘Wish You Were Here’ filled the auditorium to rapturous applause. As with show opener ‘Shine On You Crazy Diamond’, ‘Comfortably Numb’ is a song that encapsulates almost everything significant, unique and beautiful about the music of Pink Floyd, and as with that number, ‘The Album Project’s’ performance was a thing of beauty in itself, every bit as precious as the original recording, from the unconventional chord changes, the by turns melancholy, gleeful and manic themes, to the heavenly guitar solos, it truly is quintessential Pink Floyd, here performed by a band every bit as thrilling and unique in a live arena as the original. One final note, in case you were there and feel that one member of the band has gone unacknowledged in this review, fear not. It’s not that his contribution throughout the evening was any less significant than the rest, it’s simply that percussionist Andy Hart provided the perfect example of what makes this band special. One simple flourish of the miniature chimes to illustrate ‘Comfortably Numb’s ‘just a little pin prick’ broke through the wall of sound to steal the number. Even in a show of such scale and grandeur, ‘The Album Project’ are nothing short of meticulous in their quest for authenticity and when you add up all of these little touches, it truly does mark the difference between a good show, and a truly great one. Thrilling Stuff, but for this round at least, it’s all over. Given the success of both ‘Quadrophenia’ and ‘The Music of Pink Floyd’, the return of ‘The Album Project’ to live performance is almost guaranteed. Indeed, they have *breaking news* been booked to reprise ‘The Music of Pink Floyd’ at The Cheltenham Playhouse on October 8th 2016 – call the box office now on 01242 522852. Or if you can’t wait, they’re bringing ‘The Music of Pink Floyd’ to the ‘FOXSTOCK’ event at The Fox Inn, Little Barrington, Oxfordshire on Saturday, 27th Aug 2016, with more dates and venues sure to follow. Be sure to book your tickets early though, as based on audience reaction to their last show at The Cheltenham Playhouse, demand is sure to be through the roof. As to ‘what next?’, part of the thrill in the upcoming months will be guessing which opus they will choose next, with the band even inviting their fans to throw their own suggestions into the mix. It might well be one of your own cherished favourites; it might easily be something you’d never even considered that’s up next, but either way, you’re in for one hell of a show. 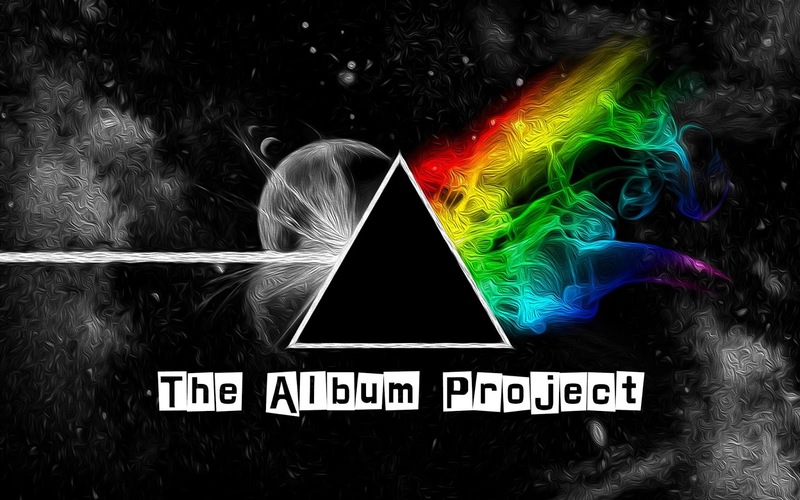 For more information on ‘The Album Project’, visit the band’s official website at www.thealbumproject.co.uk. There you will find more information about the performers, as well as a little history about the project and assorted tidbits to pique your interest until your chance to see them for yourself. The band’s facebook page too will keep you informed of upcoming gigs, as well as providing some fun banter, pictures of the band and even links to some sound and video clips of the recent gigs. Go to www.facebook.com/thealbumprojectuk and give them a ‘like’ – you won’t regret it. Images - Band website and courtesy of Richard Olpin of richardolpinphotography.co.uk.